Many homeowners are under the false impression that pressure washing will damage or cause harm to painted or stained surfaces. This is a myth that has no factual backing and has been caused by improper pressure washing either by homeowners themselves or inexperienced contractors. 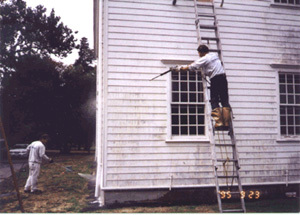 The fact is that yes, a pressure washer can remove paint or stain from a house or deck. But if the pressure washing is being by a trained user this should never occur. Painted or stained surfaces do not necessarily require “high” pressure. Our system relies on our Mildewguard Detergent to do the work. Our detergent is applied to the painted or stained surface and after sufficient dwell time it is rinsed down with hot water. 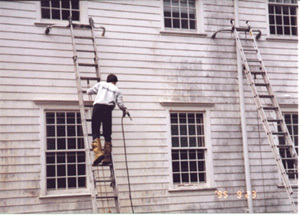 The rinsing occurs from a distance that will have no effect on the removal of any paint or stain. Our methods are guaranteed to remove all mold, mildew, algae and any other surface stains leaving your paint or stain looking like new.